Please fill the information below for ordering or send us your questions, ideas or suggestions. Please give us some extra details about where and when to pick up. If you live in a hard to navigate compound, hints for finding your place would be most appreciated! Include Chinese characters and Pinyin if possible. Thanks in andvance and have a great sausage day! Natural Casings Can Vary In Size. A benefit of duck products, including the duck fat, is the high level of unsaturated fatty acids making the composition similar to olive oil! These unsaturated fatty acids protect the cardiovascular system and are very tasty! Once we receive your order we will send you a confirmation email or add you on wechat. The confirmation email is not automatic, we will send it after reading the mail. All sausages are hand made in small batches to control quality therefore it is advisable to order a few days in advance of when you would like to pick up. If you order ahead your items will be reserved for you. 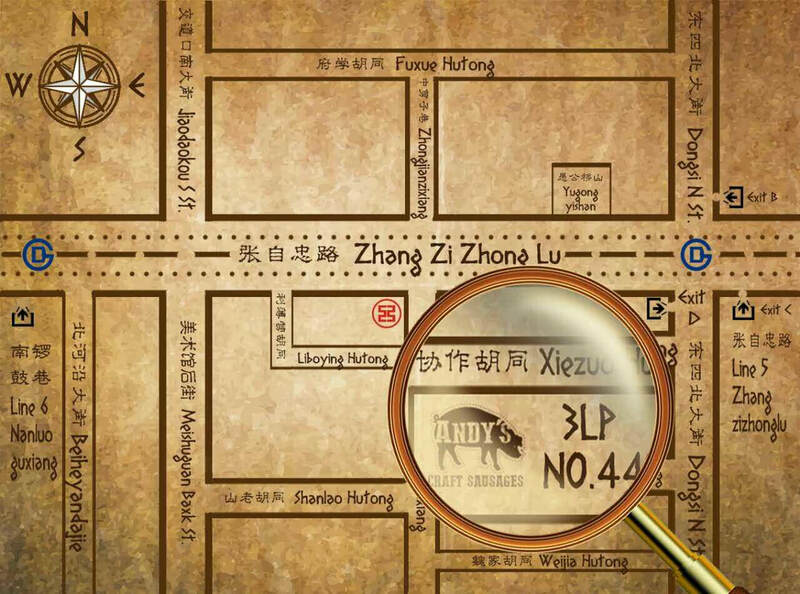 Free delivery is also available for orders of at least 3kg and within 3kms from the Sanlitun area. smaller orders are accepted for delivery within 3km with a small delivery charge. In most cases orders can be picked up the same day from 3 Little Pigs. The shop stocks all flavors that are in stock, in the case something is out of stock in the store, we may be able to get some from our central kitchen, just ask. Bacon is available most of the time, but we do not mass produce this item and it takes 7 days to produce, so we may be out of stock for a few days from time to time. If you would like to order loose sausage meat please order in advance so it can be packed for you the next time the flavor is produced.